Are these Langley’s biggest pumpkins? On a quiet farm near Campell Valley Regional Park, orange giants are visible nestled among the spreading vines. Theyâ€™re some of the largest pumpkins in Langley, and their grower hopes theyâ€™re among the biggest in the Lower Mainland. 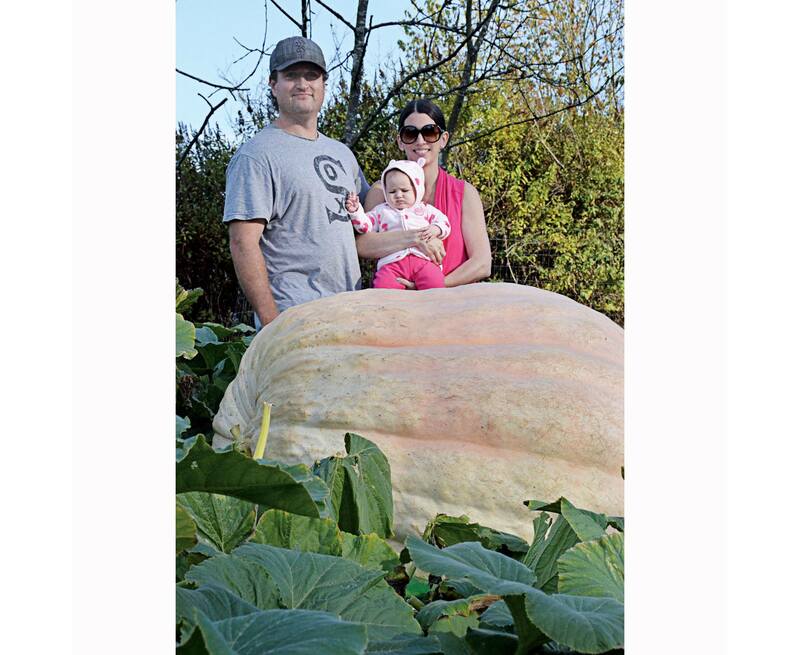 Scott Carley grew his first giant pumpkin 10 years ago, when the family was living in Delta. He raised one to over 600 pounds in his back yard. When he heard about the local Giant Pumpkin Weigh-Off at Aldor Acres, he took the biggest of his big orange squash and tied for second place, weighing in at 853 pounds. â€œIt started off as something fun for him,â€ said Kirsten, Scottâ€™s wife, who has helped out with the care and feeding of the giant pumpkins. This year, with Kirsten was expecting their daughter, and Carley skipped his annual trip to the familyâ€™s Manitoba farm where he oversees the annual seeding. To keep himself busy around the property, he threw himself into growing several pumpkin patches full of pumpkins weighing hundreds of pounds. The larger of the two is over five feet wide, and neither of them will fit into a truck. Heâ€™ll have to move them using a trailer. The pumpkins are Atlantic giants, a breed known for its huge size. Kirsten noted that when he had to head east to work on the farm, he left her a series of instructional videos on how to care for the pumpkins. There are strands of drip tape under the pumpkin beds to deliver water and nutrients. The pumpkins themselves rest on beds of sand or on styrofoam to keep them from rotting from damp. Nearby are several pup tents, thrown over the pumpkins during hot sun to save their skins. The pumpkins can gain dozens of pounds a day during their fastest growing season, notes Scott. The big danger is that theyâ€™ll grow too fast and split. He lost several to that already. Some of them he probably lost because he was experimenting and pushing to see how big he could grow one of the giants. â€œMy goal was to grow something over a thousand [pounds],â€ he said. Some of the ones heâ€™s already lost to splitting, and some of his current crop, definitely surpassed that mark. Scott guesses heâ€™s hit 1,000 pounds four times already. Once the contest is over, one of the biggest pumpkins will wind up as the most impressive jack oâ€™lantern on the block. â€œA full saw barely makes it through,â€ he said. The work should be worth it for the reactions from kids. Last year they carved up their second-prize winner and put it out by the driveway, and heard many kids who doubted it was even real.